Love this little miniature Santa in his sleigh. He was stamped on acetate. The die cut homes were adhered to the back of the acetate and the whole sheet was then adhered to the back of the white frame. Some blue starry designer paper was taped to the card base along with the moon. Then the white frame was adhered to that with foam tape so that it stands out and away from the base. When I was a little girl I would try and stay awake on Christmas Eve to get a glimpse of Santa. In my imagination I pictured that he would look something like this as he rode through the night sky. Fabulous scene you have created here! Love the card! Wondering who makes the sleigh stamp? Thank you! 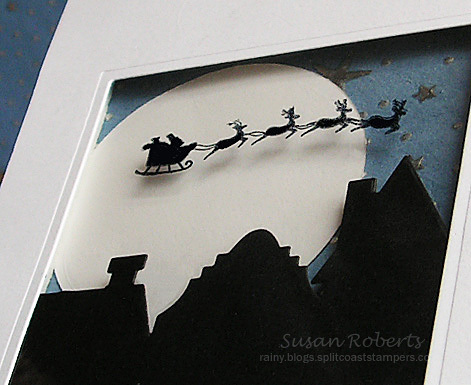 Oh, Susan, this is fabulous, and I love the beautiful scene with Santa and his sleigh! It’s so striking, and what a perfect night sky background! Oh, my friend, I’ve not done much myself either, but we’ll definitely have to pick up the pace…hehe! Totally beautiful, and someone is going to love this and will cherish it (and most likely put it out each year). It’s a keeper! Hugs! Wow! I thought your Santa’s sleigh was die cut at first, but I read that you stamped it. It sure turned out perfect! This looks fabulous, Susan! I love how you have used this stamp set! Stamping on the acetate really creates a 3D effect against your wonderful full moon. Lovely and clean and looks fantastic! Thanks so much for joining us at CASology this week! Oh my gosh this is amazing. What a gorgeous, creative design! 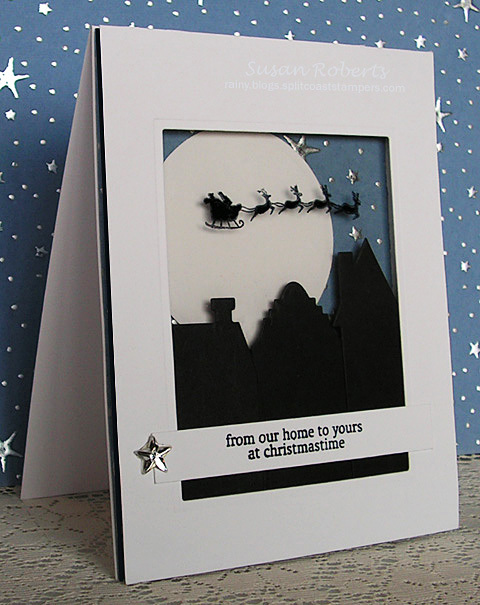 Susan – This card is quite amazing! It fits your childhood ideal perfectly. The Santa and sleigh silhouetted against the moon and sky is awesome. I love when I see your blog email in my mail. You do such wonderful and creative work that inspires me. I appreciate your work. Love your card! I haven’t even thought about what I’m doing for Christmas cards this year, so you’re way ahead of me. TFS. Wow, this is a stunning card! Oh how cool is that, such a great idea to stamp it on the acetate, love the dimension it gives to the card and your neat starry sky with the houses, fabulous!! WOW! I just LOVE how this looks over the acetate!! It has a wonderful 3-D effect with it!! STUNNING! !